Can a Ride on Hong Kong’s Outdoor Escalator be Romantic? 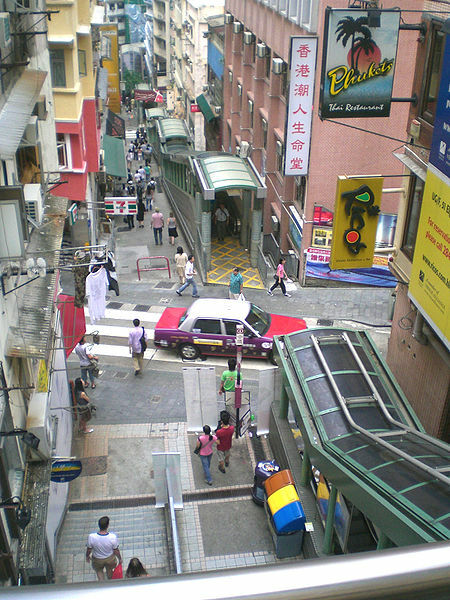 Hong Kong’s Mid-Level or Hill’s Escalator runs 2 miles through the city linking the Central and Western Districts of Hong Kong Island. It rises 443′ up the side of a hill and is the world’s longest, outdoor covered escalator system. It was constructed in 1993 and each day over 55,000 people use the free system of twenty escalators and three inclined moving walkways. There are fourteen entrances and exits making it very accessible. To ride it from start to finish takes twenty minutes but it only goes in one direction at a time. From 6 am to 10 am it runs downhill enabling commuters to get to work. Then from 10:30 am to midnight it runs uphill for tourists and shoppers. You may have seen this escalator in films, most notably the 2009 Batman film – The Dark Knight. 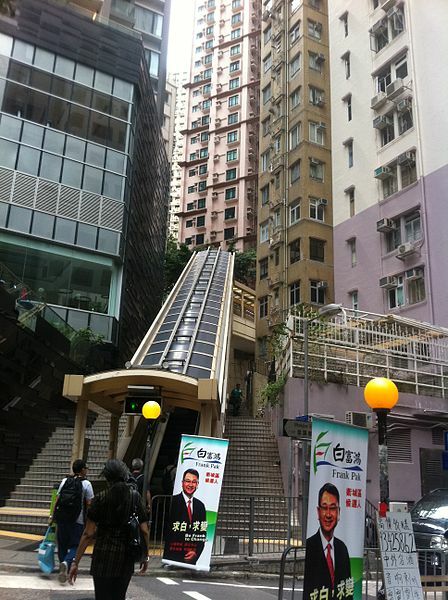 So to my question – could a ride on Hong Kong’s outdoor escalator be romantic? I think it could definitely be romantic. Picture it at night. You and your date are riding the escalator on your way to a nice restaurant for a candlelit supper. You are standing by the windows, he has his arm around you and you’re both gazing out at the city lit up like a Christmas tree. You look up at him and he leans down to softly kiss your lips. Does anyone else have an idea how an escalator ride could be romantic? I’d love to hear from you. Hong Kong Treasure, coming in 2014. I thought I’d start this blog with telling you a little about myself. I am married with two sons, one in college and one finishing high school. Our cat showed up on our doorstep one icy November day eight years ago and now has us all pretty well trained to her specifications. I was considered a tomboy in many respects growing up but I also spent a good deal of my time curled up in a chair reading a book. Although I’ve had a few different jobs, I now work part-time at my local library. To be around books and people who love them as much as I do is my idea of paradise. And getting paid to be there – wow! In my early twenties I discovered a love for martial arts and studied the Korean style of Tae Kwon Do and Combat Hapkido. I also enjoyed watching martial arts movies. Bruce Lee, Jet Li, Jean Claude Van Damme … but my favorite was always Jackie Chan. They were all the inspiration for my first novel. Hong Kong Treasure, is a contemporary romance which takes place in Hong Kong. Deshi Han is a famous martial arts actor and director who has no time for a serious relationship. His career and charity works are his life and a relationship would take valuable time and energy away from them. However, on a charity trip to the Philippines after a typhoon he agrees to help a young Caucasian woman stranded with no memory. He brings her back to Hong Kong to rest and recover assuming it was just another act of charity. He soon finds his scheduled life taking some unexpected turns. Not only does he have to deal with his budding affection for the girl but a danger revealed in the girl’s nightmares may turn out to be real. I am a contemporary romance author and this is my blog. Welcome! A deadly Philippines typhoon stole Annie's memory. Now, can a handsome Chinese stranger save her from the danger she has forgotten? Why Should Earth Day Be Just One Day? Have You Read This Romance Yet? Books, Words & Lists – What’s Not To Love? © Diane T. Wickles and D Dominik Wickles Romance, 2014. Unauthorized use and/or duplication of this material without express and written permission from this blog’s author and/or owner is strictly prohibited. Excerpts and links may be used, provided that full and clear credit is given to Diane T. Wickles and D Dominik Wickles Romance with appropriate and specific direction to the original content.